Our fabrication team often uses Computer Numerical Control (CNC) routing machines for cutting plastics in various shapes and size. These machines are capable of highly intricate designs in composites, steel, wood, plastic, acrylic, aluminum, and foam. CNC routing machines are computer-controlled and are perfect for producing high-quality, consistent cuts over and over again. Our design team uses CAD software to layout the project and the computer reads the drawing specifications and cuts to the exact design coordinates. 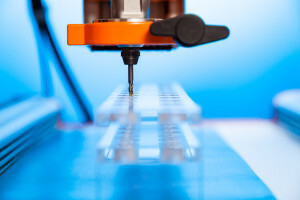 Because of its high level of accuracy, this plastics cutting method reduces waste, frequency of errors, and can help get your finished parts off the assembly line faster. Our team will often use CNC routing when cutting very precise, or small shapes as the accuracy of these machines produces superior consistent cutting every time. It’s often a great tool for creating detailed or complex prototypes, seals, business signage, awards, and other parts. If you think your next project might benefit from being cut using our CNC routers, contact us to get a quote and recommendations.